Most of the colors of the rainbow show up in the river-washed aggregate we call Rainbow Rock. Reds, pinks, blues and greens really make the landscape come alive with color - especially when wet. 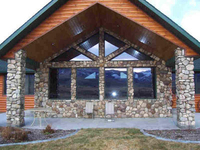 Masonry projects such as columns and fireplaces are quite striking when built or faced with this stone while water features and dry stream beds take on an enhanced effect with the use of Rainbow Rock. 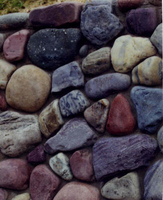 Here's a little tip on how to jazz-up a dull, low-maintenance, river rock ground cover...use the cheap, local 3/4" or 1 1/2" river rock to cover the area being "xeriscaped" and then sprinkle or seed the surface with mixed sizes of Rainbow Rock for a jazzy hint of color without the expense of using all Rainbow Rock. This soft, beige-gold cobble is at home as a veneer, wall, cobblestone path border or drystream bed. It is beautifully sorted and packaged at the quarry in a wide variety of grades.